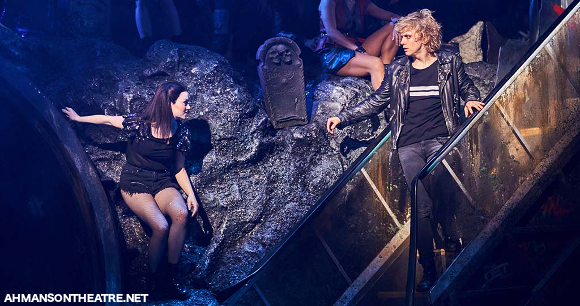 It’s the rock musical everyone’s talking about – ladies and gentlemen, are you ready for Bat Out Of Hell?? 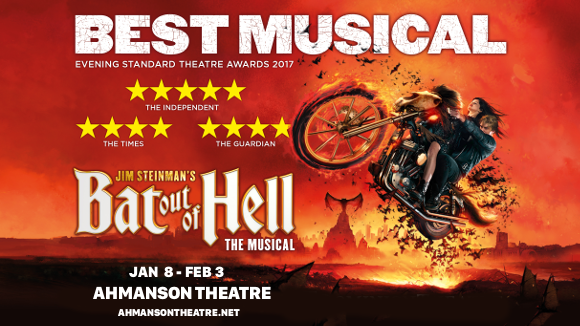 The musical, written by legendary songwriter and producer Jim Steinman and inspired by Meat Loaf’s trio of bestselling albums, follows in the wake of We Will Rock You in the telling of a dystopian romance to a soundtrack of iconic songs. Loud, powerful, and a lot of fun – you can’t do better when it comes to entertainment!! Book your tickets early for your chance of the best seats at Bat Out Of Hell. With the original Bat Out Of Hell album – with sales of over 43 million copies and multiplatinum selling sequels – conceived as a rock opera in its day, Jim Steinman took his time to finally bring the work to the stage. Four decades to be exact. Based loosely on the story of Peter Pan, Bat Out Of Hell is the final culmination of an idea Jim Steinman has been incubating for a long, long time. 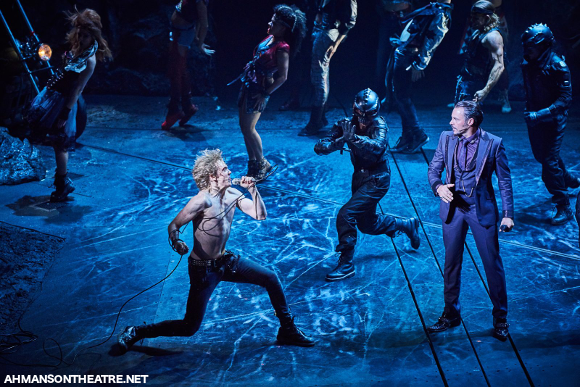 And the extra time and toil has paid off – Bat Out Of Hell: The Musical is an extraordinary production. When it first premiered, the musical was instantly popular with audiences and critics alike, earning solid positive reviews across the board. Set in a dystopian future Manhattan, known as Obsidian, ruled over by a tyrannical political figure Falco, Bat Out Of Hell tells the story of The Lost, a group of teens permanently stuck at age 18, and their leader, Strat, who falls in love with Raven, Falco’s daughter. Sexuality and rebellion abound in a musical fuelled by motorcycles, dancing and hard rock music – it’s hard to find anything not to love. Meat Loaf’s second album, “Bat Out Of Hell,” was released in 1977, and swiftly became one of the best-selling albums of all time, with many of its songs regarded as rock staples, and the album as a whole iconic in its own right. Certified a staggering 14 times Platinum by the RIAA, ranked by Rolling Stone on the list of the 500 Greatest Albums Of All Time as recently as 2003 and spawning two also multi-platinum certified sequels, it’s really no wonder that this was the obvious basis of the next musical to follow in the wake of productions such as Quadrophenia, Mama Mia!, and We Will Rock You. 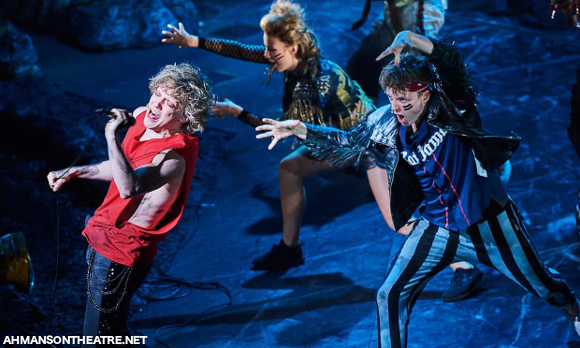 The cast of Bat Out Of Hell: The Musical inject new life and power into a familiar soundtrack, with songs such as “Two out of Three Ain’t Bad” “Dead Ringer for Love,” and “I’d Do Anything for Love (But I Won’t Do That)” taking centre stage as focused duets and rousing chorus numbers. If the music wasn’t enough to sell you (and it should be) then the stage production will. Bat Out Of Hell’s imagery-heavy is state-of-the-art and an incredible sight purely in terms of conception. Already featuring a skyscraper designed like an enormous guitar, at the top of which Raven’s bedroom sits, the characters just visible through a thin gauze, and elaborate props and artful constructions making up the dark underworld of Obsidian, Bat Out Of Hell goes one step further in terms of immersion, with cleverly placed cameras projecting an on-set-view of the characters onto select areas of the set as they traverse the underground tunnels of the dystopian world, allowing audiences to feel as if they are right there in among the action as well as viewing it all unfold from above. Bat Out Of Hell’s set is cleverly tailored to fit as many purposes as possible, with multiple props serving several purposes upon being flipped or rotated before sliding once again out of view. Pyrotechnics, explosions, dazzling lights and special effects are utilised throughout. You’re in for a huge, high-energy, jaw-dropping performance, with raw vocal talent and energy abounding across the stage, accompanied by spellbinding special effects, set and costume design, and, of course, Meat Loaf’s timeless soundtrack. Prepare to be entertained! Do you have your tickets yet?? The best seats will go quickly – don’t delay in getting yours! !